R8 Styling Index - You're on the Right Track Now! "Serving German Car Enthusiasts since 1996"
Visually, here is the modification to your Audi that provides "biggest bang for the buck." A straight up swap for your OEM piece with LLTeK's Quantum RS styling in facelift or before facelift fitment. Badging options too! Wheels for Audi designed and made in Italy. The engineer who started this company was a rally racing enthusiast, and like all engineers shares a contempt for the cheap stuff. Traditional styling right up through the cutting edge! LLTeK is pleased to offer an entire array of custom carbon fiber modifications for the Audi R8. These fine hand-crafted parts are produced with the knowledge that anything less than Audi's R8 standard - will not get out the shipping door, let alone anywhere near a customer's car. 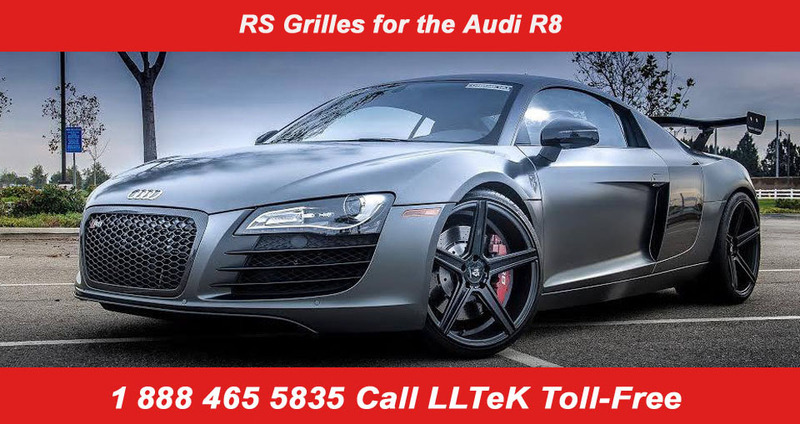 Look to LLTeK for a broad range of product for Audi's R8 line. We started this section with a suite of carbon fibre bodykit parts for the original Audi R8 produced by German tuner Hofele. Many owners of the R8 in North America have expressed frustration with the dealerships' inability to source side blades in Carbon Fibre. LLTeK has these parts for the Audi R8 and will contine to add options.